Just a bloke from Ringwood, Victoria, Australia. I'm about to go back to Uni to study a masters, and thought I would blog the experience. Woah. Two posts in one day… what’s the world coming to. I’ve decided that I really want to post more, but I need to not care what others think. So I’m going to write posts on anything that comes to mind, or interests me. Well, as we progress to the end of October, so far I’ve only had 2 people donate to my Movember campaign. That’s a grand total of $63.50. I’m actually sort of disappointed. But I’m sticking to what I said, so it looks like the beard stays. Quite a few people have said to me, “Why don’t you just shave off your moustache, and leave the rest of the beard?”. I can’t it’s not the way Movember works. And I respect the Mo too much to bend the rules like that (also they wouldn’t allow me to get free burgers from Grill’d with more than a Mo). One of my workmates has bluntly said to me “When are you going to shave that thing off your face? Don’t you want a girlfriend?”. Well yes I do want a girlfriend, but I have never shaved (or not shaved) for a girl before. And if I did, I can tell you, she would have made a serious impression on me. I never even shaved off my goatee for my fiancé when I was engaged. But that’s another whole story that I’m not going into here. So with only 6 days till my self imposed deadline, I am putting in one final plea. 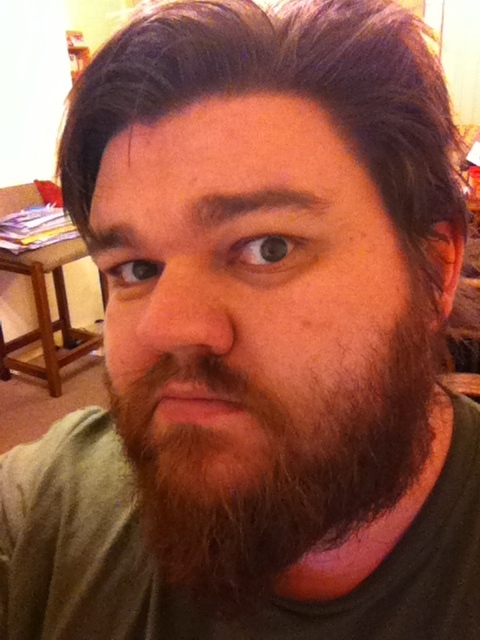 If you want me to shave and do Movember, please donate through my profile (you can find it at http://g.rff.me/Movember). I know I haven’t written a post in a while (and I frequently seem to start my posts this way), but this is important to me, and I need people to give me feedback. I have participated in Movember in the last 2 years, and part of that has been because of family that have actually been affected by blokey cancer and partly because I think it’s manly to grow facial hair. Now if you know me personally, or on social media, you will have noticed in the last 2 months I’ve started to let my beard grow out. Originally I was doing this because I’d seen a pic of the cast of Dwarves for the upcoming films The Hobbit: An Unexpected Journey (2012) and The Hobbit: There and Back Again(2013), and decided, out of solidarity, that I would grow an appropriately Dwarfish beard for the release of the films. Yes I know that’s a really nerdy thing to do, but back in year 8, I played Oin in my middle school play version of The Hobbit. Now, I have no gray hairs, so I’m not recreating my part in the play in real life, but I was at least planning on turning up to the films with a long flowing beard… and an Axe. To get back on track, what has this got to do with the honorable institution of Movember? Well, my dilemma lies in the fact that I’d love to once again participate in Movember, but I didn’t think of that when I was starting on my noble quest to grow my Dwarfish beard. One of the rules of Movember is that you have to start the 1st of Movember clean shaven. You will decide if I’m doing Movember or not. I’ve decided that I will shave my beard, and grow a Mo for Movember if I can reach a donation target, before the end of October. Last year, I had $335 donated through my efforts. This year, I’d love to get to $1000. No, I don’t expect that to be donated through me by the end of October, BUT if I were to match last years donations (that’s $335 by the end of October), I’ll shave my beard and do Movember properly. So, how do you donate? Go to http://g.rff.me/Movember and you will find my Movember account. I will post updates here about how things are going. Please leave a comment about whether or not you think I should shave the beard, and support the Mo. UPDATE: Wow, straight off the bat I’ve already had one donation for $33.50 from DoubleTake. That’s 10% of the Pre-Movember target. Are you going to help force me to shave off my beard? Well, I scored a couple of free tickets to get to see Griff The Invisible yesterday morning. How did I get these tickets? All thanks go to whoever is running the Twitter account @GriffTheFilm. They saw my comments about this being a film about me, and followed me on Twitter. So what did I think of Ryan Kwanten‘s portrayal of my life? I thought it was excellent, but I’d just like to point out one detail. I don’t have an older brother called Tim. Other than that, I will not confirm or deny anything else about the accuracy of this film in reference to my life. I would really recommend going and seeing it. It has a touching plot, well acted, and it’s Australian. Also one final thing. During the film, you see a building with “Griffiths” (pic of it here on Flickr) written on it. That is definitely related to me, and I should write about both it and why I deserve (or at least need) a “Miles to Griffiths Teas” Enamel Sign. The film isn’t due to be released until mid March, but I would love to see it again. Yes, it really was that good. and it stars Ryan Kwanten as ME!!!!! I decided to write this post, because of a phone call I had with my Aunt this evening. I'll start by laying all the cards on the table of the situation. My Aunt is on the sunset side of 60, and isn't the greatest with technology (though she can email, etc). Well, it started in the late afternoon, with three phone calls. When my Aunt answered the phone, there was no one on the other end of the line, and then a few seconds later, a recording saying "Thank you for you call". The fourth call had an Indian sounding man on the line, who started by claiming that the company he worked for was receiving "Error Messages from your Microsoft Computer". Wow, I haven't updated this in a while. I should really do this more often. Thanks to a friend on twitter, I decided to work out how many films I've watched, both in the last year, and this year. Now, because I'm coming to the ballgame late, I'm starting with a continually updated list of the films that I've watched this year. The ongoing list can be found on my Movies Page, and if you want to see what I saw in 2010, check out my list on the Movies 2010 Page. Also, if you'd like to make any suggestions for Movies that i should watch, drop a line in the comments. I just upgraded to WordPress 3.0. No issues with the Automatic Upgrade (that I can see yet). Seems pretty painless. In fact, I did it via my iPhone. Next thing I should really do is upgrade/change my theme. And before you say "OOooo… You're just jealous that I have an iPad, and you don't." No I'm not. I've used one, and DO think it is a really impressive machine. I don't have an iPad cos I don't need one, want one or afford one. I'd rather save up and get an iPhone 4GTS (or whatever it's going to be called), because that will be a much more useful tool for me. Just a bloke from Ringwood, Victoria, Australia. I've just finished being back at Uni to study a masters... Now what do I blog about? Should I shave my Beard for Movember?